Parisian Artist Kofi Frimprong and his installation inside the Project Room at The Hollows. You may remember from a couple of months ago The Hollows' inaugural exhibition, which showcased a giant permanent ceiling mural created by Brazilian artist Talita Zaragoza and done entirely in Sharpie (goes to show that with scaffolding, a Sharpie and some persistence anything can be done). This permanent piece was exhibited alongside the works of nearly 20 international artists, transforming a 2-story Bushwick Avenue brownstone into an art oasis. When an invite for their second exhibition, opening this Tuesday, December 9th from 6 - 10 PM arrived in my inbox I was instantaneously excited - eager to see what the second installment of what I like to think of the "Art U.N." has in store. 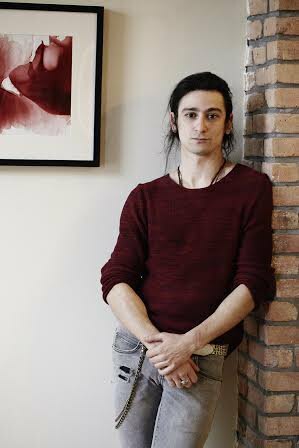 The Hollows' exhibiting artist Serkan Altinoz. The Hollows' second exhibition, titled "coddly//demure," explores the binary relationships of the two odd words, even diving deeper and unearthing the idea that femininity and masculinity should be viewed as coordinates, not opposite or an equation of each other. "In Turkey, I became involved with Queer Theory, especially after taking two courses titled 'Queer Aesthetics and Contemporary Film' and 'Film Ethics Erotics,'" explains The Hollows director and curator Piril Gunduz. "Besides always being sensitive to gender issues, after getting into the New School MA in Media Studies Program I have become more involved in what we can call post-feministic issues. This show is after all about sexuality, from abstract paintings to verbal performance art." The Hollows' exhibiting artist Miquel Garcia. Piril went on to explain how gallery goers should expect to see a wide range of works in "coddly//demure"– from iron cast sculptures to a painting by a 9-year old, to a photography project where a contortionist turns into the photographer (thanks to a telephoto lens). Works by established artist Marisol Escobar, whose pieces are in collections such as the MoMA and The New School Art Collection will also be a part of the show. 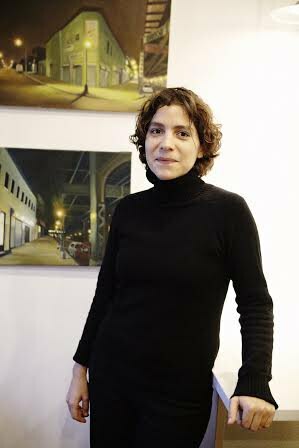 In addition to the exhibiting pieces, a 4th permanent artwork by artist Kira F. will also be unveiled. Piril mentioned that permanent pieces are very important due to the nature of The Hollows, "Instead of being a commercial gallery, we really value curation and we do have an architectural sensitivity to art and the displaying of art." The Hollows installation artist Kofi Frimpong. 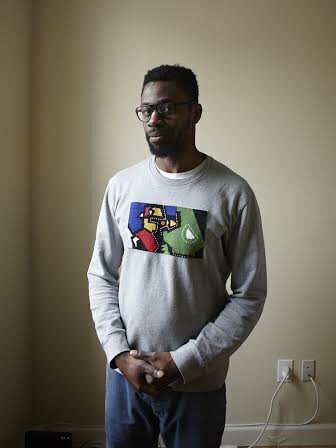 Visitors should also not miss 35-year old Parisian artist Kofi Frimpong's installation, which will be in the Project Room, a collaboration between The Hollows and the artist. Kofi's installation "Prehistoire Moderne (Retour a l'Origine)," completely encompasses every surface of the room – all 4 walls, floor and ceiling are painted. 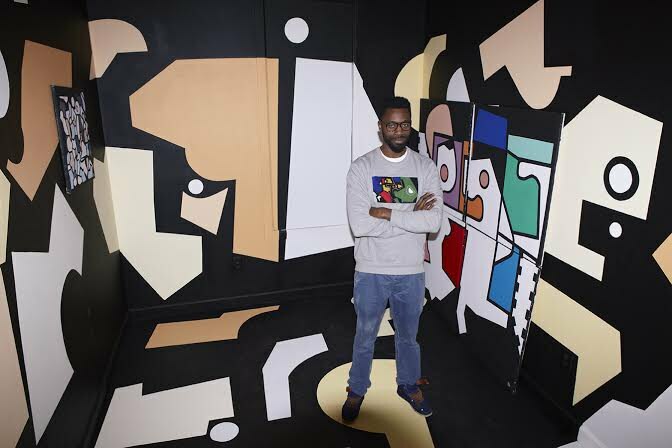 Kofi's giant graphic creation, influenced by primitive arts and the pop iconography of comics in the 1960 Da Vinci's history, allows the viewer to "travel the depths of the caves of his constant ebullition" and to see for themselves his artistic evolution. Not to mention his work's energy and vibrancy is reminiscent of (beloved) Keith Haring. In terms of future plans and goals, it is only up from here. 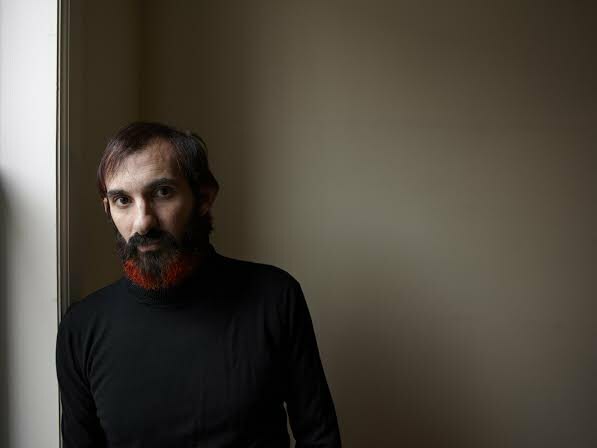 "Aside from making the two new programs – Project Room and Curator's Room – an ongoing thing, we are planning to make the third exhibition on dance and the fourth on the intersection of superstitions and post-nationalism," described Piril. "Also, during the dance exhibition we are looking forward to working with DJs and performers on an event-basis. We are actually currently collaborating with a maker on making our permanent ceiling piece into an electronic music device/data." The Hollows, which is an art hub housed in a duplex brownstone along Bushwick Avenue, has both exhibition and studio spaces on both floors and provides six bedrooms with ensuite bathrooms for resident artists and curators. Residents can collaborate with the gallery towards exhibiting their works during or at the end of their residency periods, depending on the scope of their projects. To find out more information about The Hollows, visit their website; to find out more information about article photographer Alonzo Maciel please visit: www.alonzomaciel.com. 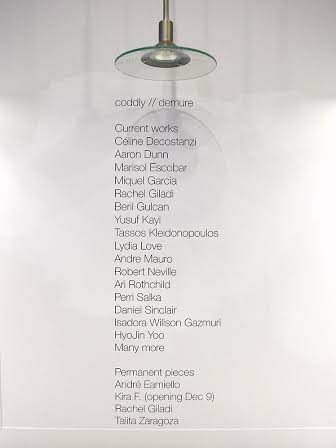 "coddly//demure" opens on Tuesday, December 9th from 6-9 PM at The Hollows, 708 Bushwick Ave, Brooklyn NY 11221 Apt 2.